Bud is becoming a little sheared as it approaches the coast of Mexico today. The eye structure that was apparent on satellite yesterday has vanished. Winds and rain will increase on the coast during the day. I am estimating a lower maximum sustained winds from the Hurricane Center based on satellite imagery. Some gusts may be in the 110 mph range still. As of 8 am edt / 5 am pdt Bud was centered near 18.0 N / 105.5 W or about 105 miles sw of Manzanillo, Mexico / 165 miles south of Cabo Corrientes, Mexico. Movement is nne at about 8 mph. Top sustained winds are estimated at 90 mph (NHC 110 mph). Pressure is estimated at 964 mb. 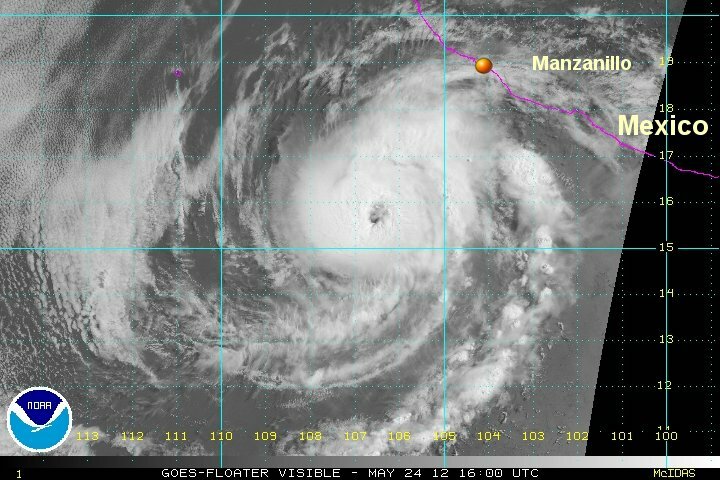 Bud is predicted to stall near the coast north of Manzanillo. All hurricane preparations should be completed by now. The Hurricane Center agreed with our previous assessment and has taken winds down dramatically. The downgrade was after a Hurricane Hunter plane confirmed the weakening. An eyelike feature is present again. Convection is only impressive on the northwest side of the circulation. The worst effects of Bud will stay offshore as it parallels the coast. As of 2 pm edt / 11 am pdt Bud was centered near 18.9 N / 105.5 W or about 75 miles west of Manzanillo, Mexico / 105 miles south of Cabo Corrientes, Mexico. Movement is north at about 7 mph. Top sustained winds are estimated at 75 mph (NHC 80 mph). Pressure is estimated at 990 mb. Bud is predicted to stall near the coast north of Manzanillo and slowly weaken the next few days. Bud started interacting with land and cooler water yesterday. The circulation has collapsed. Only low clouds and some showers remain near the west coast of Mexico.